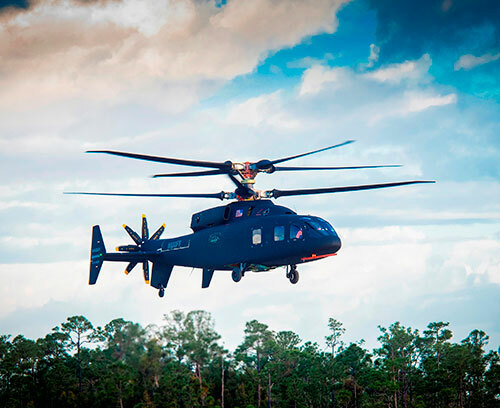 The Sikorsky-Boeing SB>1 DEFIANT™ helicopter achieved first flight at Sikorsky’s West Palm Beach, Florida, site. This revolutionary aircraft, developed by Sikorsky, a Lockheed Martin Company, and Boeing, will help inform the next generation of military helicopters as part of the U.S. Army’s Future Vertical Lift program. “Clearly, the performance, speed and agility of DEFIANT will be a game changer on the battlefield and we look forward to demonstrating for the U.S. Army the tremendous capabilities of this aircraft,” he added. “This design provides for exceptional performance in the objective area, where potential enemy activity places a premium on maneuverability, survivability and flexibility. We are thrilled with the results of today’s flight and look forward to an exciting flight test program,” Spoor added.